Mast hinge Raising the mast on a Flying Scot is a one or two man operation if equipped with the mast hinge. The older Scots came without the hinge for raising the mast, if your boat doesn't have one buy one and install it before raising the mast. Park the trailer on level ground facing into the wind. Remove everything from the cockpit floor and seats, you don't want to have anything to step over when you are holding the mast. Have a bumper or cushion on the stern so the mast won't scratch the fiberglass. If someone holds the top of the mast it really helps while you pull the mast to the stern and put the mast hinge pin in the slot on the rear of the mast. 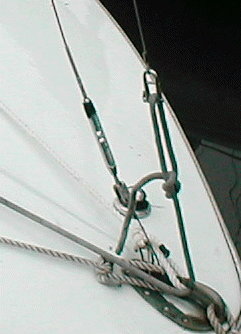 With the jib halyard shorter than the mast, tie it to a line run through the bow eye and back to the cockpit. Hopefully you have a spinnaker cleat near the mast you can use, if it has a padeye mounted on it be sure that the line is through the padeye. You can also use a jib cleat. The most common problem is the shrouds tangling or catching on something, so you need to position them so they will raise smoothly with the mast. If you tape the lower shroud connections so they can't tangle it helps. Be sure to check the shrouds and forestay at the top. If you get the mast up and one is crooked, you can't reach it and will have to lower the mast again! It can be handy to have a helper on the ground to get the shroud unhooked from whatever it hangs on. Stand at the back of the cockpit, pick up the mast and face forward. Raise the mast over your head and walk forward, SLOWLY! If one of the shrouds DOES catch on something and you are going fast it may jerk the mast to one side and make you drop it. When the mast is up, pull the line tied to the jib halyard tight to hold the mast up, and cleat it well as shown. 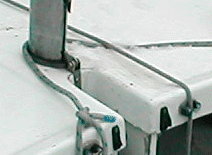 This picture shows the mast being held up by the jib halyard, with the forestay lying on the deck. 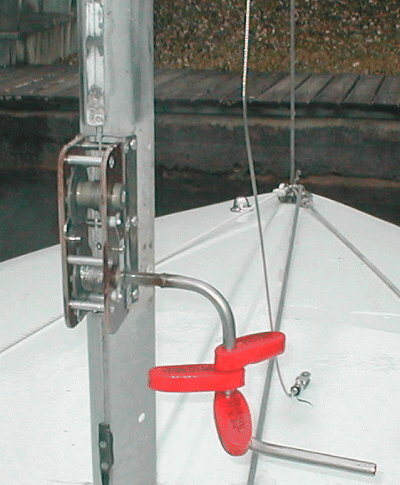 Use the halyard winch to tighten the halyard enough to attach the forestay. If the forestay seems just a bit short, double check the forestay and shroud attachment points up on the mast to make sure they are straight. Notice the key chain floats on the winch handle to make it float. My stainless steel handle requires three, but the aluminum will only need one or two. Boating enthusiasts who consider purchasing the new Viking Yachts for sale will usually want an experienced deckhand on board to help them out. Sailboat lovers are more likely to enjoy the hands on aspect sailing provides boaters rather than the conventional yachting experience.